I found the tent camper pictured above in the want ads for $200.00. I won’t say when, but I will say I have owned it longer than the original owners, so that would make me older than the camper. They took great care of it and their main advice was never put it away wet. I took that advice and after all these years the canvass is still 100%. It’s a great piece of engineering. It has an aluminum box on wheels with doors on the side for storage, a mattress on top of the box, and a full size tent with attached collapsible tent poles that fold over the mattress for storage. The mattress keeps me off the ground in cold weather, it absolutely doesn’t leak, there is room for two more guys on the floor plus an aisle down the middle so it’s roomy enough for three if need be. The storage compartments handle all my camping gear including sleeping bags, a screen tent, tarps, cookware, tackle and tool boxes, etc. 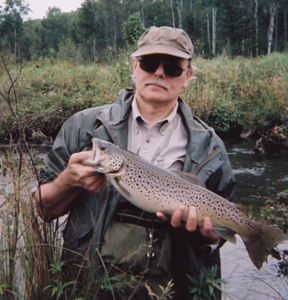 In bad weather, which can happen at either end of Michigan’s trout season, it stays warm inside with just a propane lantern. There is a coolness factor to owning and using something this old. People ask about it at campgrounds and want to look inside. Apache had a great idea. I guess the popularity of dinette campers convinced them to abandon the idea. That’s really too bad since it is such a practical design. Update: This camper is a 1960 JC Higgens, manufactured by the same company (Vesely Mfg.) for Sears. 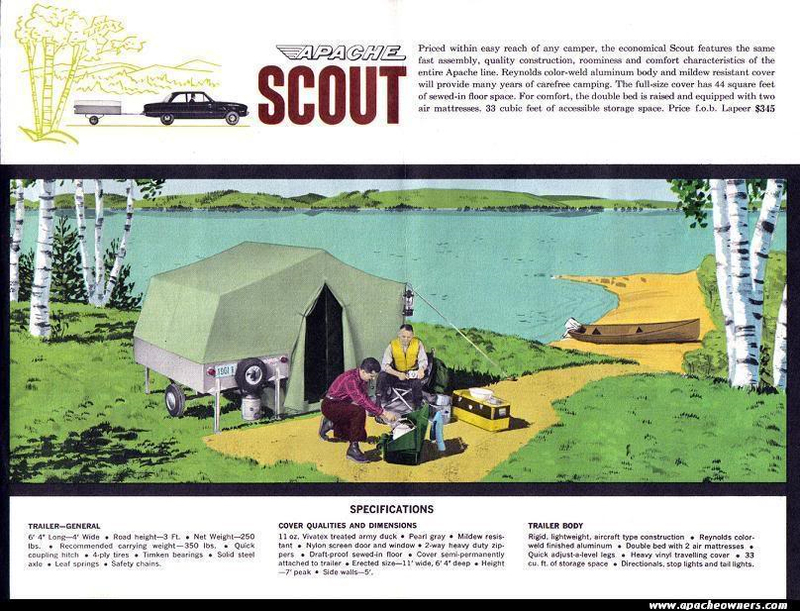 It is very similar or identical to the 1960/61 Apache Scout. If you see these tent campers together at a campground or remote spot somewhere in northern Michigan, stop in and say hello. We’re friendly. If you like to eat trout we may have some extra in the cooler you can take home for your dinner. We had the 1962, Apache Chief which we used throughout Maine each summer, especially in Baxter Park. I remember the sound of my dad using his trenching tool during bad rainstorms to divert water away so the floor did not get saturated. We had the extra zip on room as there was always at least 7 of us and sometime 8 or 9. I also remember the day my father drove it in the yard and my mother did not know what it was. My brother used it right up until 2004 and finally sold it. He kept the insignia and one of the chrome hub caps which was still on the spare. Years of great memories. I just stumbled onto your website tonight. Looking forward to reading much more. Love these campers, but even more I love “Ghost Brook Trout”. Great job guys. Wish I lived closer to MI to fish some of these streams you’re talking about and pick some guitar around the campfire with you sometime! I remember this tent so clearly. My family moved from Iowa to California in 1964. we spent 2months traveling across country with this trailer. Once we got to the bay area my father needed to find work so we continued to live in it for another month while he looked for a job. I’ve been looking for another Chief for years. If you ever want to sell it or you find another in any shape I would love to have this trailer again. I appreciate all of your comments and you may be surprised by this – this post brings the most new traffic to the fichigan blog – there are a lot of people out there that love Apache campers. I doubt I will ever sell it, more likely will pass it on to someone in the family. They’ll have to promise to never put it away wet. Just drove 200 miles from Detroit to Howard City to pick up a 61 Apache Chief box in great shape. Paid more than I probably should have. Plan on spending the winter outfitting it with new canvas from Gregory’s Canvas in Lapeer and hitting the road next spring. The coolness and barebones practicality cannot be overstated. Its like a little time machine. And made in Michigan. Gary, pretty amazing you found the box. As long as I’ve been camping, I haven’t seen another Chief. I was pretty surprised when Feral found a Scout. I think, Jake, his son, saw it set up in someone’s yard with a for sale sign – and they went right back to get it. 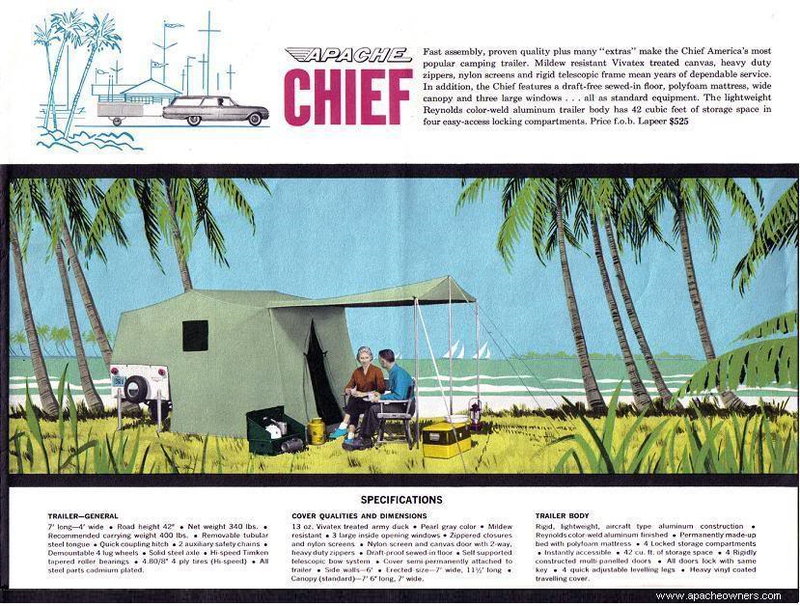 He was a little disappointed it wasn’t a Chief which sets up easier, but still, a Scouts is a piece of history too. Good luck with your canvas rework and let me know how it goes. We are a group that works to save and preserve all Apache campers. We also have round ups and gatherings all over the country. Check out the events section on the group for gatherings. I have a 73 Ramada but had a 69 Mesa with canvas. Planning on going back to canvas. Glad to see your post. I am also and avid fisherman. The Apache Chief was our first purchase before we were married. We bought it used and took our honeymoon in it to Michigan . Everything written above really says it all about the ease of set up, tear down and quality, not to mention how easy it is to maneuver into just about any campsite. We outfitted one compartment with shelves and cubbies for food storage. Glad to hear there is a Preservation Group. this is one camper that deserves it! I would love to find another Chief or even an Eagle. 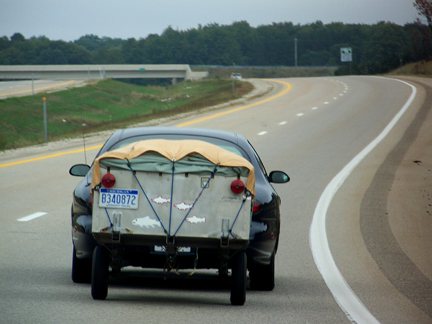 I grew up camping all over Michigan in one of these. 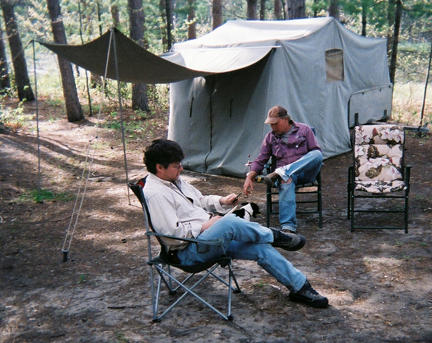 After 25 years in the Army the wife and I are back home in the great state of Michigan and would love to camp along the Au Sable in an Apache tent camper. If anyone stumbles onto one of these gems drop me an email. cot_afoor@emich.edu thanks. I have an Apache Chief in good condition. It has been stored in my garage for the past several years. The trailer also has some built in shelves in the utility section which it great for food, and dish organization. Gary – that’s what I do also – store it in the garage. I have just enough room if I put in sideways against the back wall. The folks that we bought our Chief from gave us a homemade box with shelves for camping dishes including jars of pancake mix etc – my wife an I were ready to go as soon as we got it. Cindy, We are having a big Apache Roundup Columbus Day Weekend in Roscoe, NY if you are interested. Just found your site. My Wife and I had a Chief back in the 60’s. We toured all over New England with it. Pulled it with a VW. Kept it in Vermont for deer season. I would have to shovel the snow off before setting up. I would put my Coleman gas stove in the storage area to warm up my bed. Went from the Chief to an Eagle and then to the larger JayCo trailer as family grew. HI. I just found a 1960 apache chief. I owned one back in 1983 .I was looking at teardrop camper .but when I found this camper ,well what can I say. It is in really good shape .working on bearings and tires .I found the spindle nut was rubbing the grease cap. not sure what that’s all about .looking for a taller cap or down size nut .